Hybrid approach to coding and insurance shows how coding, claims submission, and reimbursement go hand in hand. Coding exercises teach you how to correctly code using the ICD-9-CM and CPT manuals. Coding Tips boxes highlight important information. Test Your Knowledge questions within each chapter help you assess your strengths and weaknesses and prepare for exams. Code It and Claim It! program on the companion Evolve website familiarizes you with a professional coding claim interface and provides practice with actual patient cases. 2. 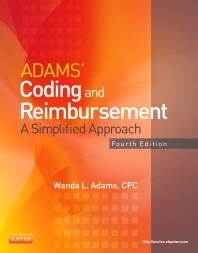 Diagnostic Coding: International Classification of Diseases, 10th Revision, Clinical Modification (ICD-10-CM) NEW! 4. HCPCS Coding System NEW!